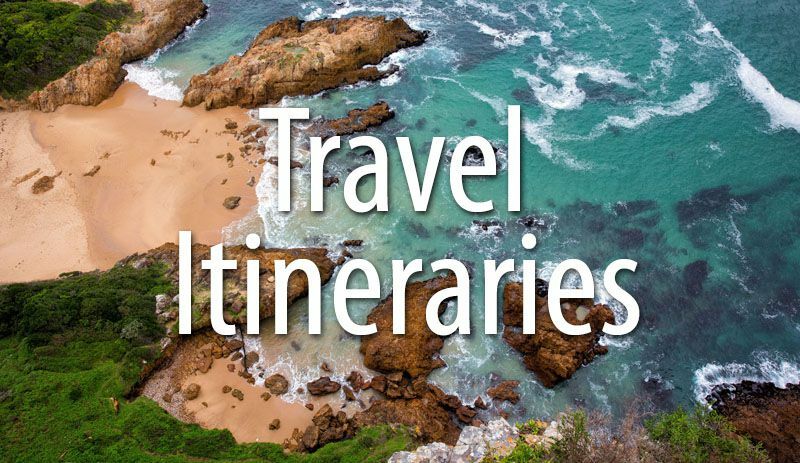 While planning our itinerary to the Balkan Peninsula, we had a decision to make. 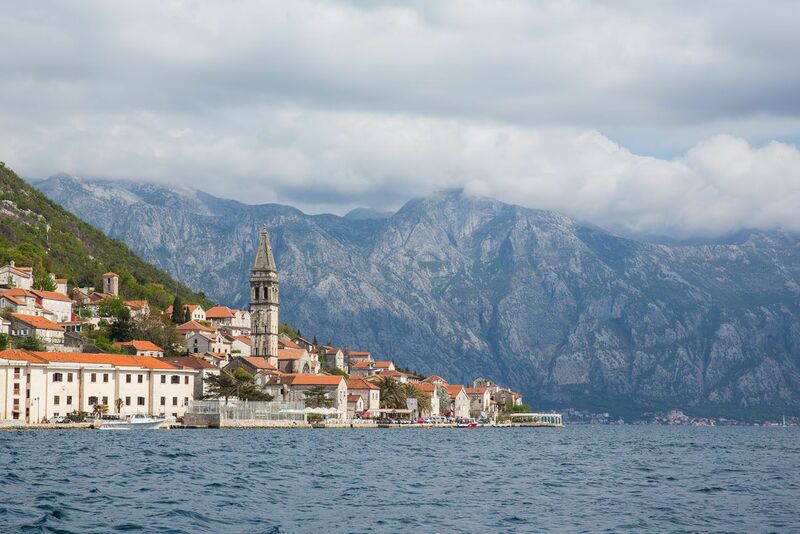 Spend several days in northern Croatia, visiting Zagreb and Plitvice Lakes, or go south to Montenegro. 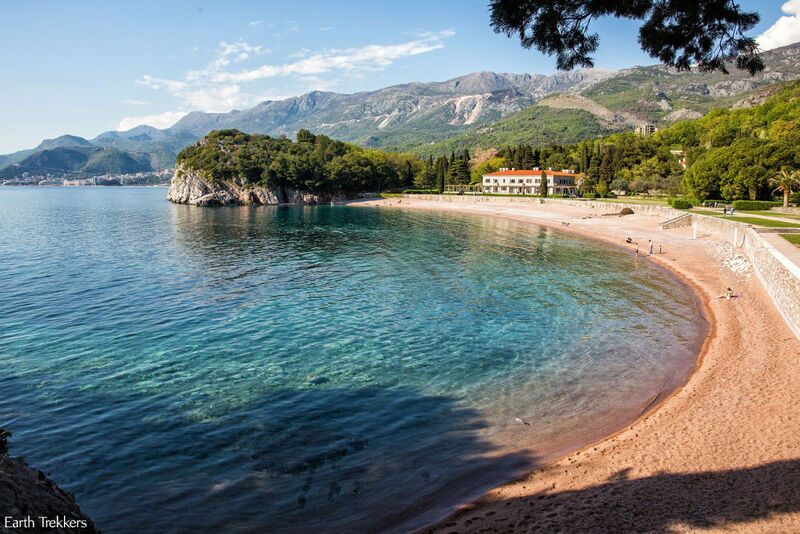 After seeing photos of Kotor, Sveti Stefan, and the Bay of Kotor, Montenegro was the winner. And it blew away our expectations. We spent 2 days in Montenegro, just enough time to learn that this country is filled with surprises and is so much fun to explore. 2 days in Montenegro is not enough time to see everything, but it is enough time to enjoy a few of the many highlights. 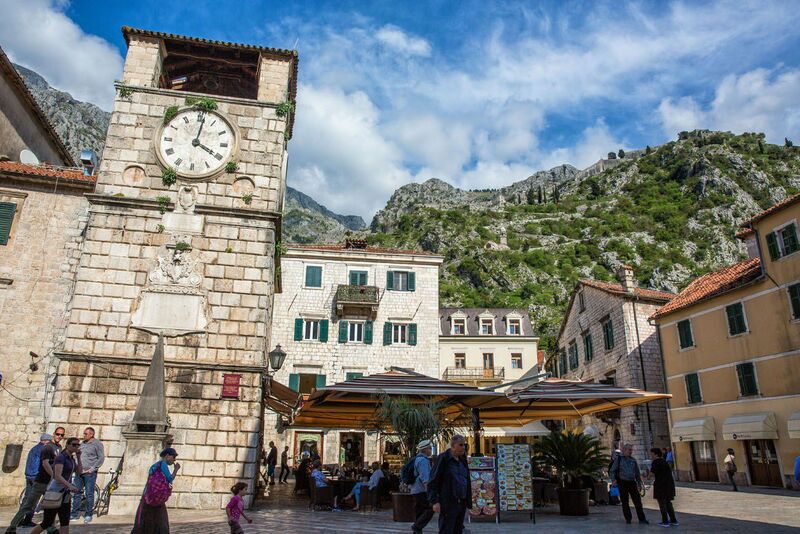 Ideally, five days or longer is perfect, which is enough time to explore the coastal towns, relax in Kotor, and then go inland. 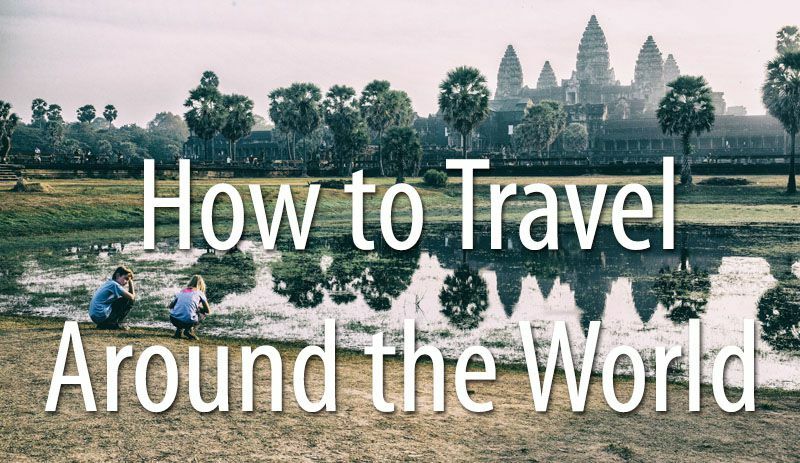 Whether you have one day, two days, or more, we have some great ideas for how you can fill your time in this amazing country. 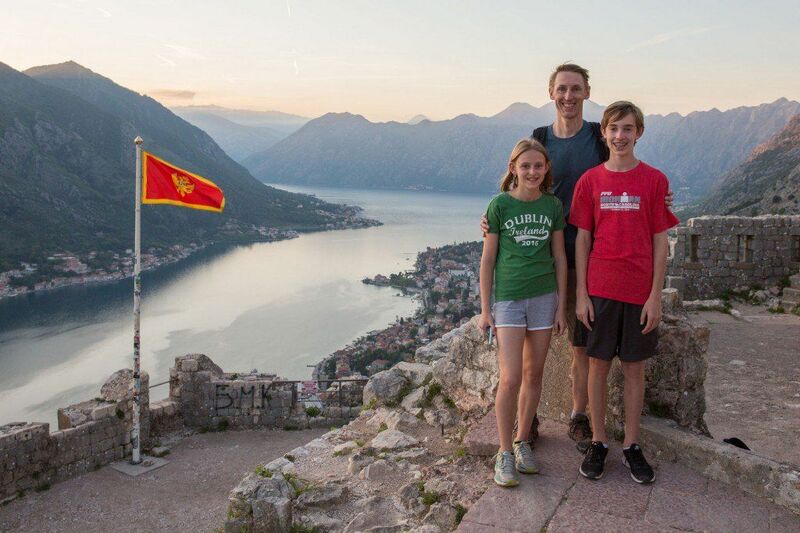 We entered Montenegro from Croatia on a 10-day road trip through the Balkan Peninsula. From Dubrovnik we drove south, making a very short pit stop in Cavtat (this was a place that we found to be overrated and crowded, even in April) and then crossed the border into Montenegro. This very busy two-day itinerary mirrors how we spent our two days in Montenegro, with some minor changes of how we would do things differently. Today will be spent exploring the Bay of Kotor and nearby sites, including Herceg Novi, Perast, Our Lady of the Rocks, and Kotor. 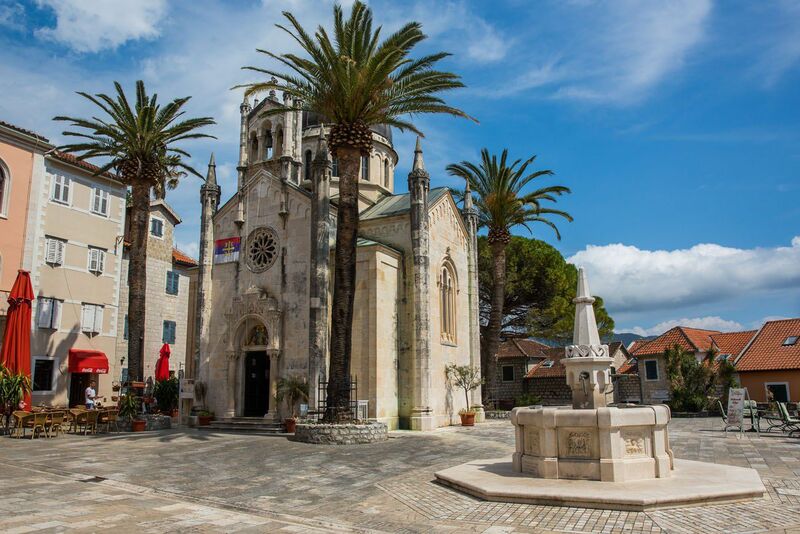 If you are arriving from Croatia, Herceg Novi makes the perfect place for a morning break or lunch before driving around the Bay of Kotor. Herceg Novi is a small coastal town that sits near the mouth of the Bay of Kotor. It is a compact town with only a few main sites worth visiting here, so it’s a quick stop but very much worth your time. Stroll through the charming Old Town, see the clock tower, and then walk uphill to the Kanli-Kula, a fortress with one of the best views over the city. 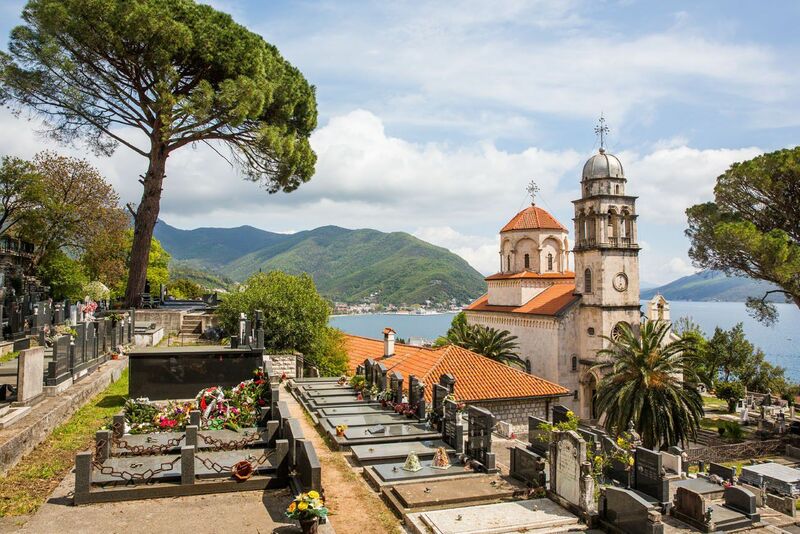 With more time, you can visit the Savina Monastery, a quiet spot with a church and an old cemetery. A highlight for me was photographing the Savina Monastery with the Bay of Kotor in the background. Getting to the viewpoint is a bit of a challenge. We drove down a very narrow, one lane road that on Google Maps is written in Russian characters (Wymckn nyt). This road ends at a gravel road. I walked down the gravel road and then down a series of long, stone staircases until I came to the viewpoint over Savina Monastery. 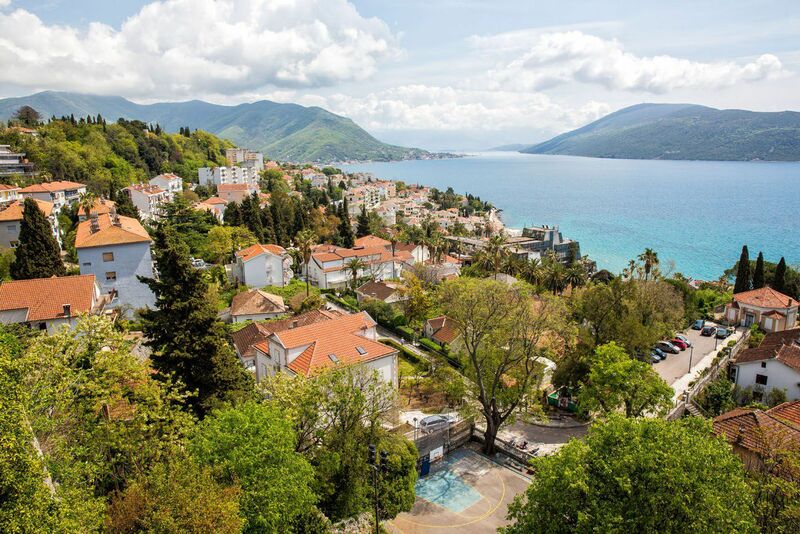 If you have more than 2 days in Montenegro, you could spend most of a day in Herceg Novi. With more time, consider making the boat trip out to the Blue Grotto or exploring Mamula Fortress. We ate lunch at Portofino, an Italian restaurant with an unbeatable location, right in the main square of the old town (Trg Herceg Stjepana). Dine on pasta and seafood and enjoy the view of Archangel Michael’s Church. From Herceg Novi, drive east to the Bay of Kotor. The Bay of Kotor almost resembles the fjords of Norway or New Zealand, with green cliffs plunging into the blue water of the bay. 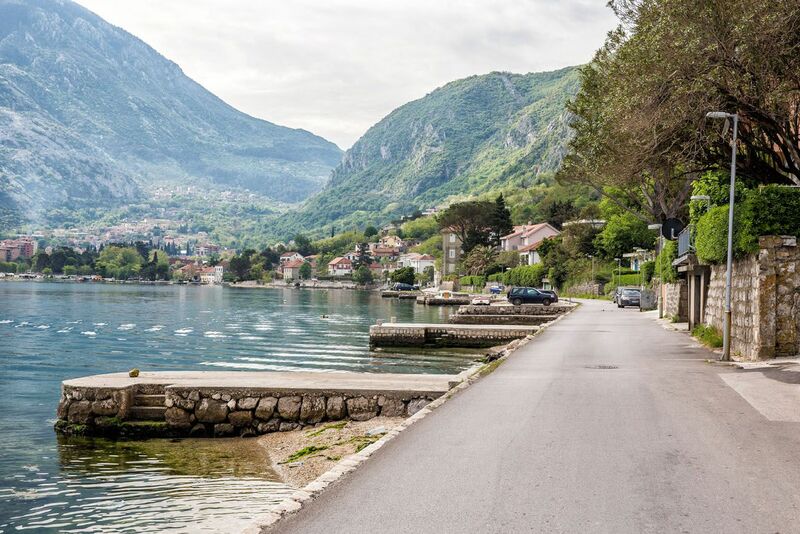 A two-lane road meanders along the edge of the Bay of Kotor, passing through small towns and villages. It’s a very scenic ride so take your time and enjoy the view. 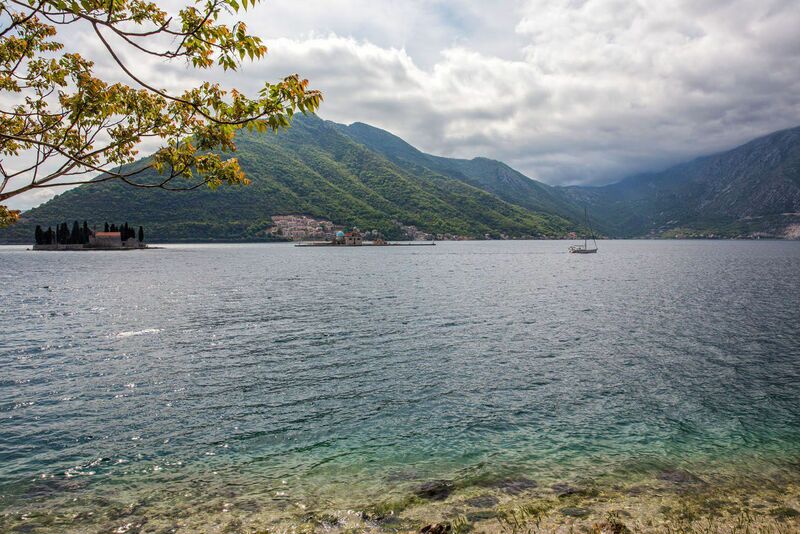 Not quite halfway around the Bay of Kotor you will arrive in Perast. This is a gorgeous town. It’s worth a quick stroll, but the most popular thing to do here is to take a boat out to Our Lady of the Rocks. 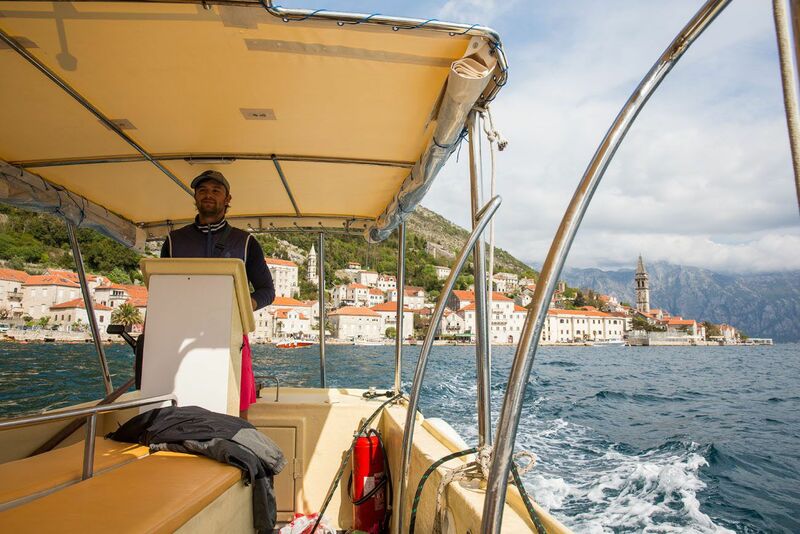 While in Perast, we were approached by numerous boat captains offering to take us out to the island. In fact, we had not even stepped out of our car before boat captains were volunteering to take us out to the island. We did not accept their offer, not at first, thinking this was a scam. 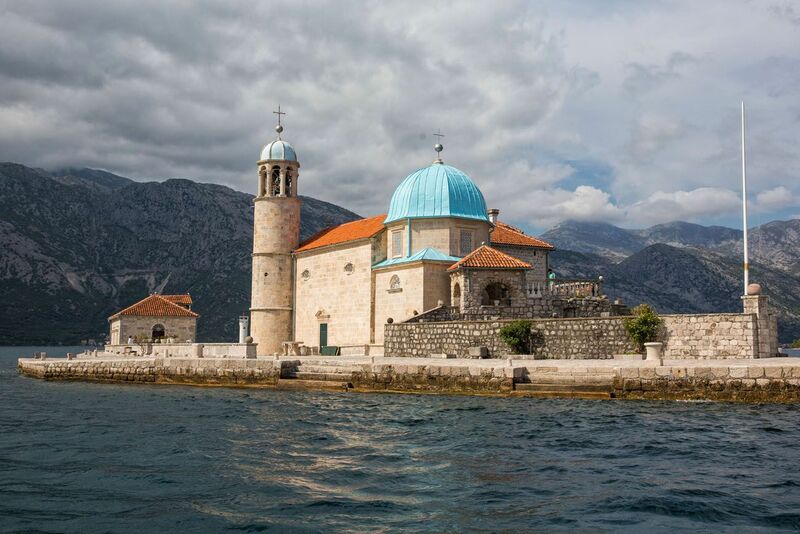 Prior to arriving in Perast I read that there was a ferry out to Our Lady of the Rocks. However, it was quicker and just as economical to hire a private boat. For €15, we hired a small boat to take us the 200 meters out and back to Our Lady of the Rocks (expect to pay €3 to €5 per person). Our Lady of the Rocks is a Catholic church built on an artificial island. On July 22, 1452, a fisherman found an icon of the Madonna and child on a rock jutting out of the bay at this location. 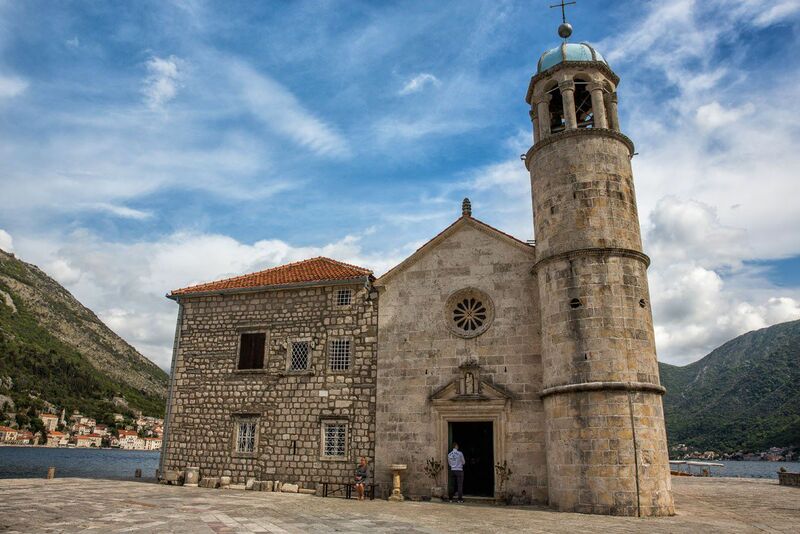 The people of Perast decided to build a church at this spot. Rocks were dumped here and the church was built on top of the artificial island. It was a small church at first, but every year more and more rocks were dropped, enlarging the island. The tradition continues today, and every July 22 local residents fill their boats with rocks and drop them around the perimeter of the island. A visit here takes 30 minutes. If you want to see the inside of the church, you must pay €1 for a guided tour. 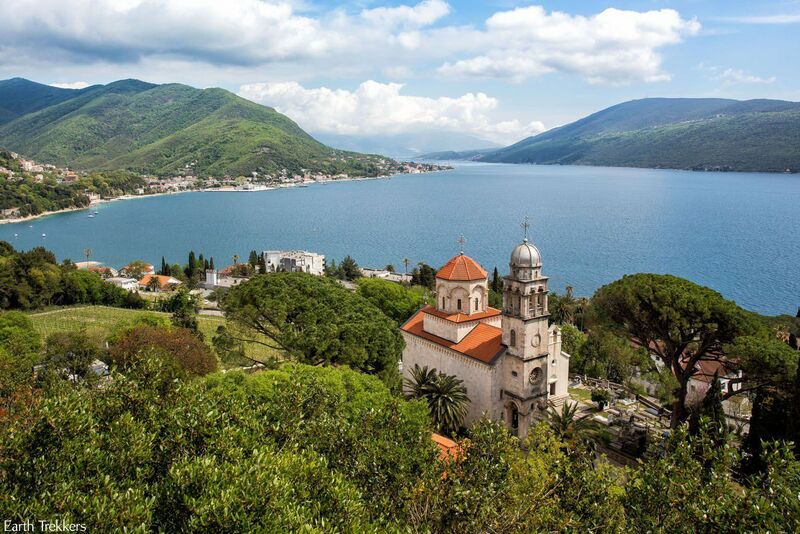 Before leaving Perast, climb the bell tower of the St. Nikola Church. The view is supposed to be amazing (we missed this because it was closed during our visit). The rest of the day is spent in Kotor. Kotor is a small medieval town. 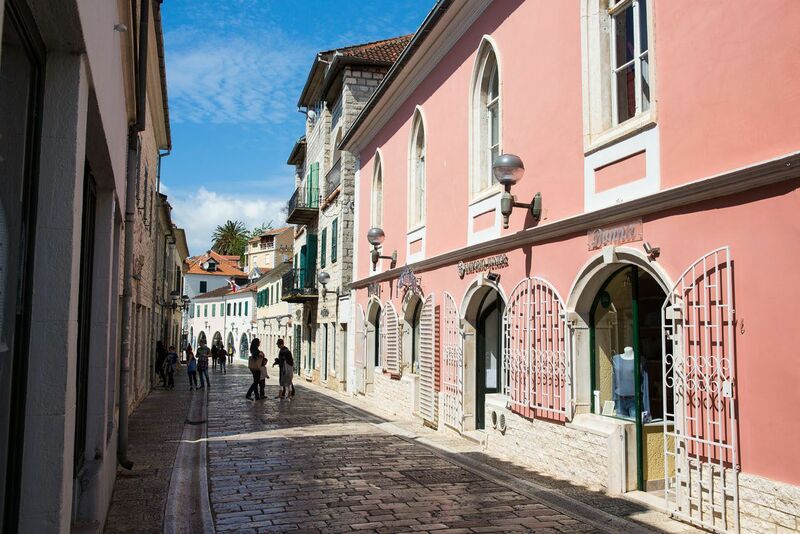 Like Herceg Novi, it is very compact and you can walk the old town in an hour or less. It is filled with restaurants, shops, and small museums. 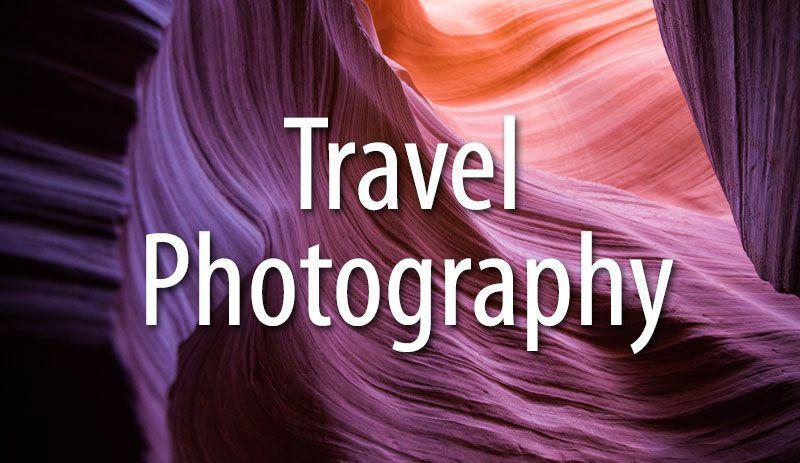 In town, we recommend seeing St. Tryphon Cathedral, St. Nikola Church, and the clock tower. Some people may enjoy the Cats Museum (there are cats all over the place here!). 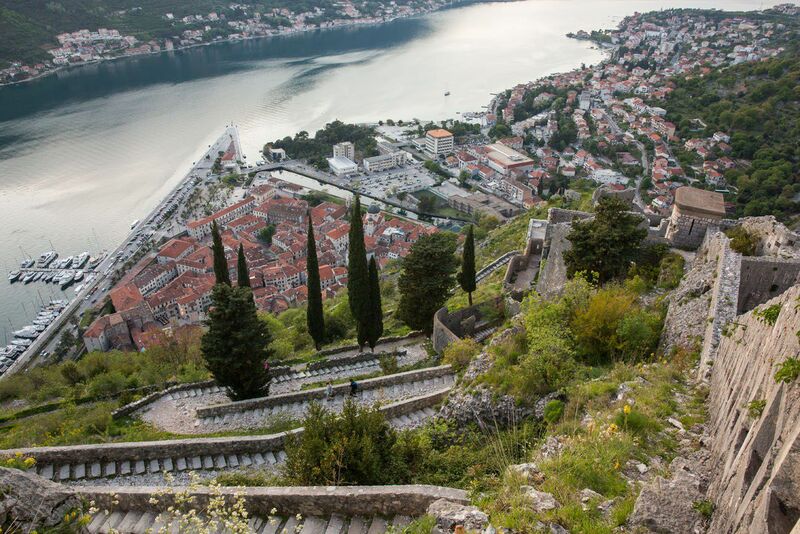 But the one thing you must do while in Kotor is climb the city walls. Built between the 9th and 14th centuries, a series of ramparts and fortified walls were built around Kotor and up St. John’s Hill. Climbing these walls provides excellent views over the city and the Bay of Kotor. Wear sturdy shoes and bring water. It’s a strenuous climb on uneven steps and cobblestone paths. 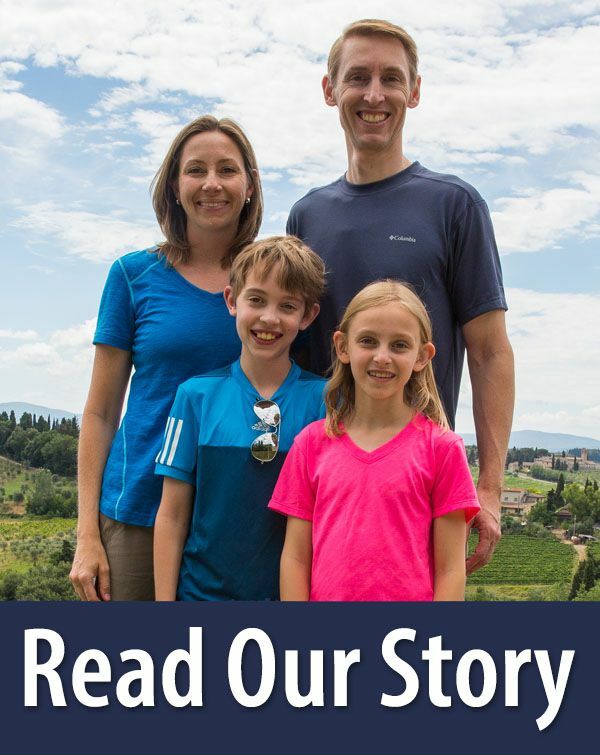 It takes about 90 minutes to walk up to the Castle of San Giovanni and back. The Castle of San Giovanni is a great spot to watch the sunset, if you don’t mind walking down uneven stairs at twilight. 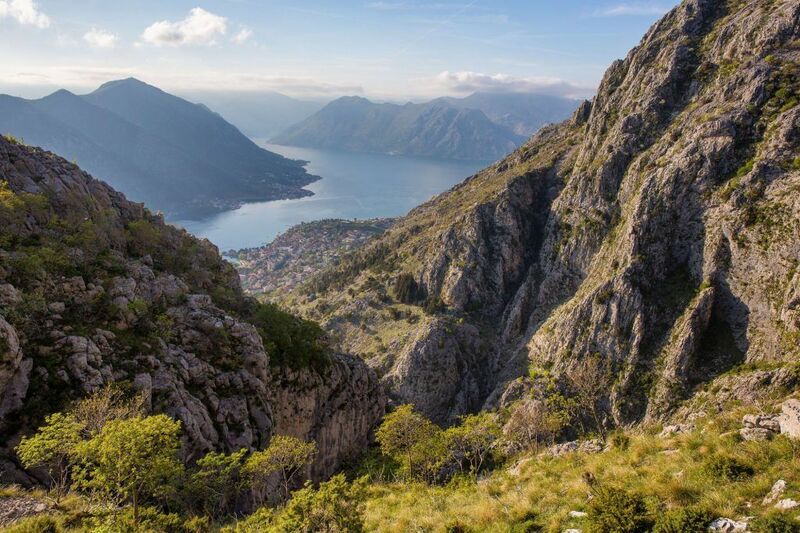 For those who are looking for even more adventure, consider hiking the Ladder of Kotor. This hike is 6 to 8 miles round trip, depending on how far you choose to hike up the mountain, but it ends with a walk down the city walls. Even though we managed to squeeze this in today, starting in the mid-afternoon, we do not recommend starting the hike so late in the day. This could be done the morning of day 2 (if you don’t mind missing out on some of the activities on day 2). Today ends with dinner in town. We highly recommend Ladovina Kitchen and Wine Bar. The food is excellent, the best we had in Kotor. This restaurant is located within walking distance of the old town, on Njegoseva near the traffic circle with E80. Today is a busy day and it helps to get an early start (9 am or earlier). 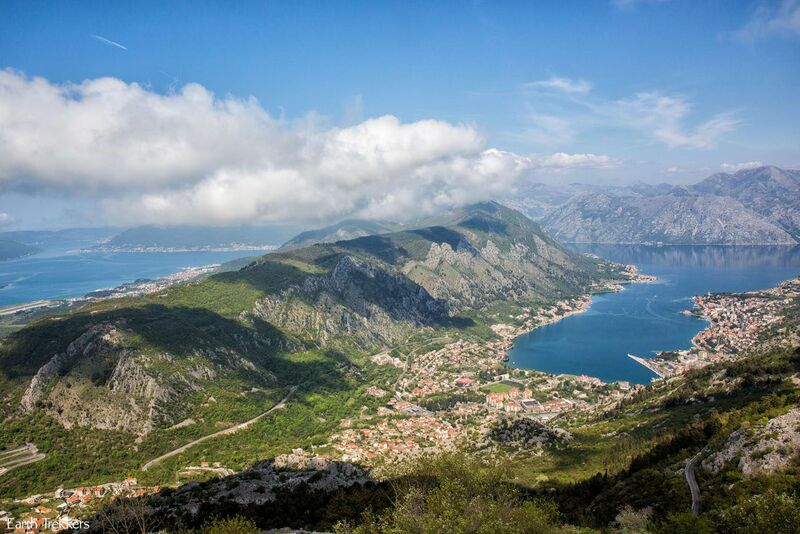 Today starts with a scenic drive for one of the best views over the Bay of Kotor. 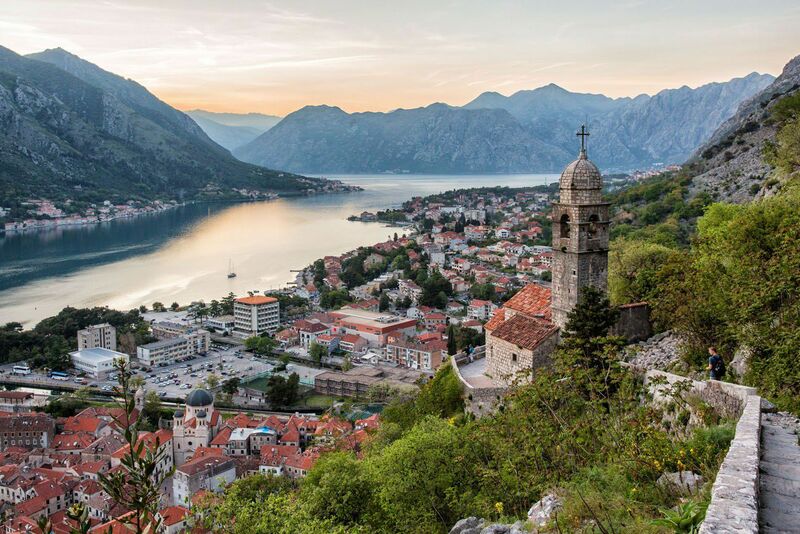 From Kotor, head south out of town on P22 and turn left on P1 for a winding, climbing road that takes you high into the mountains behind Kotor. 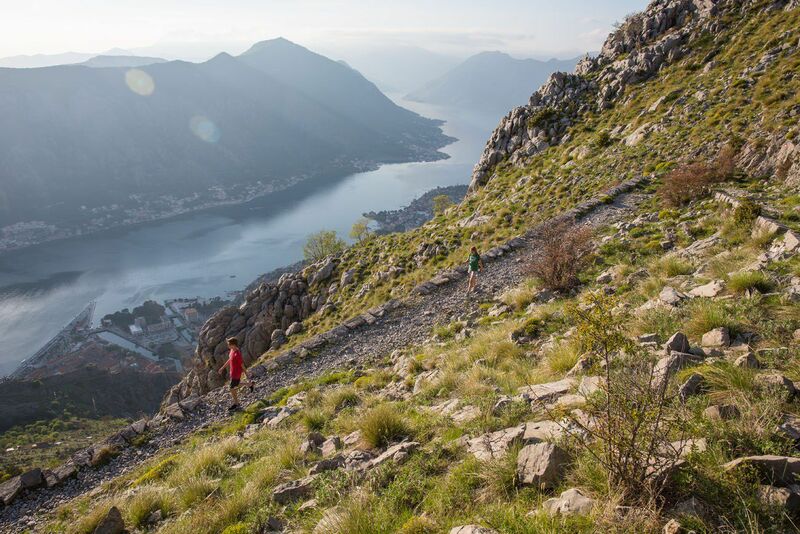 After a series of tight switchbacks you will have a stunning view over the Bay of Kotor. 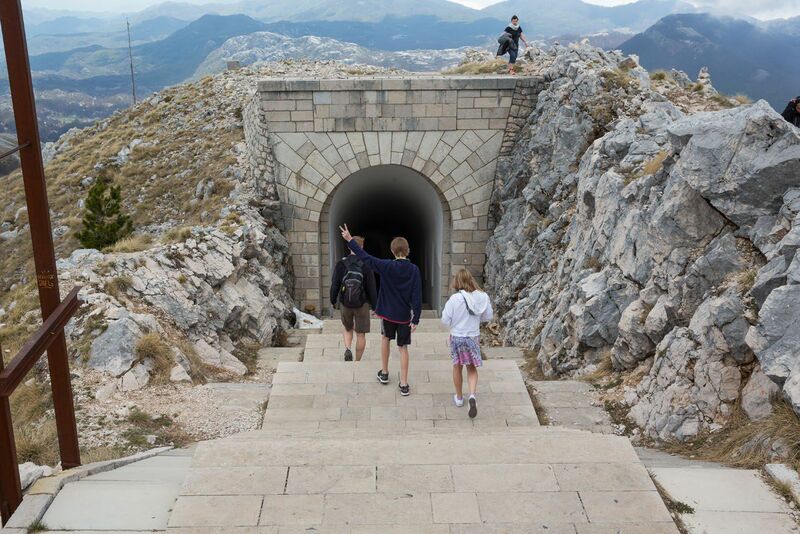 Continue the climb into Lovcen National Park. Mount Lovcen is one of the highest peaks in the area. The views from up here are breathtaking, especially if you are lucky enough to have clear weather. It was cloudy while we were here, but it was still incredibly beautiful. To get here, we turned right from P1 onto a narrow, one lane road. 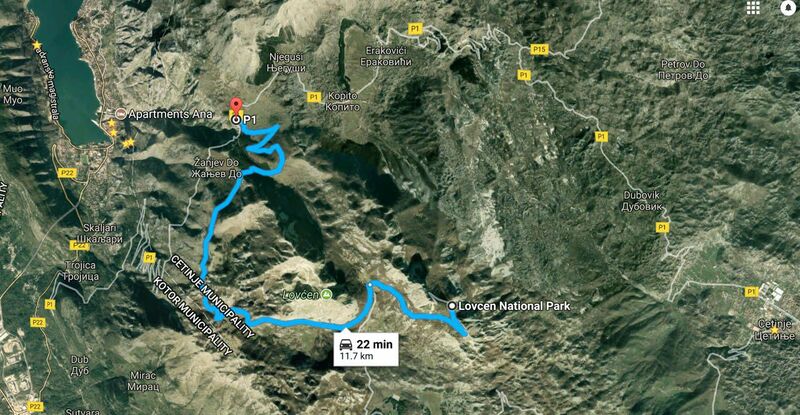 There was a street sign here for Lovcen National Park but the road is unnamed on Google maps. 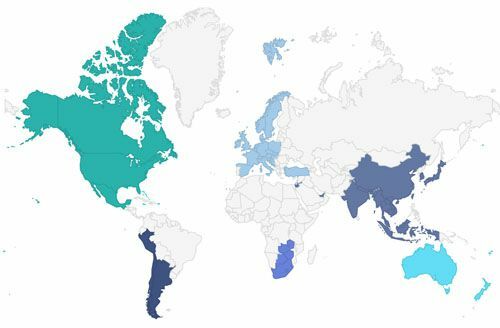 See the map below to follow our route. 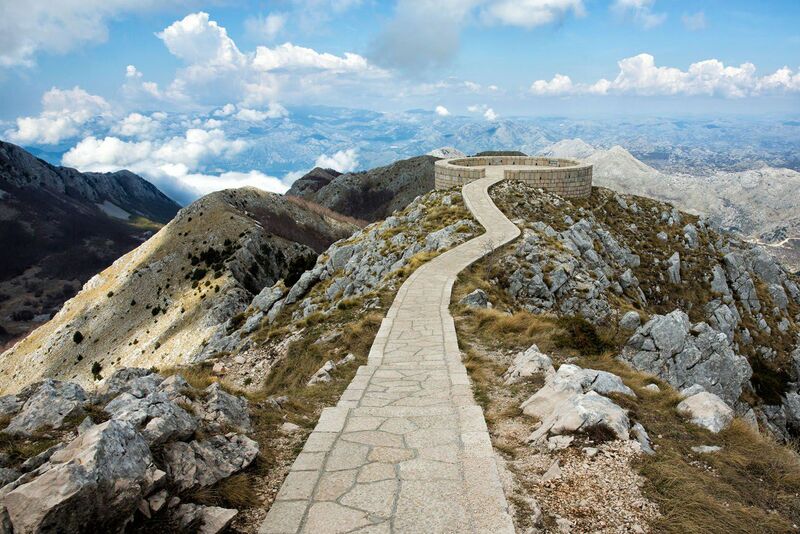 From Mount Lovcen, drive east to the town of Cetinje. Cetinje was the former capital of Montenegro. We had lunch here, although it was an interesting experience trying to find a restaurant that actually served food midday. As we walked through the main part of town, we passed café after café filled with people drinking beer and cocktails, but no one was eating food. It was the strangest thing. Finally, we found a small pizza place and had lunch here (Pizzeria Obelix). 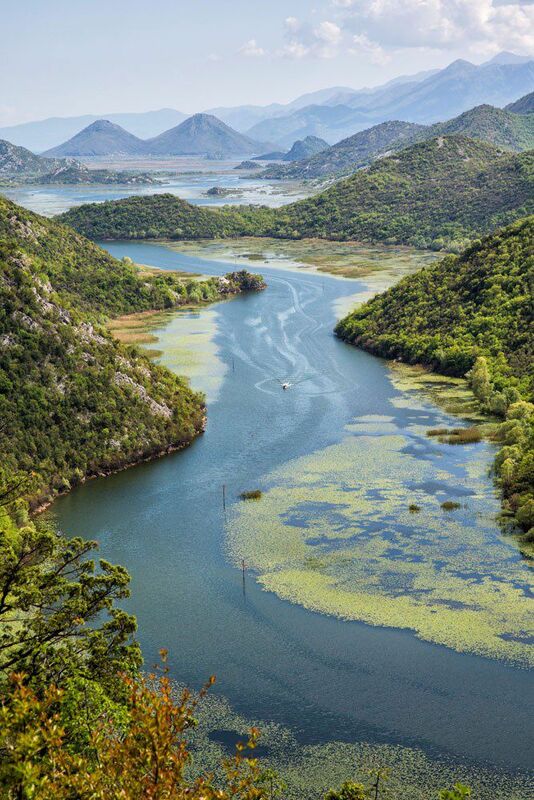 From Cetinje, you have the option to visit Lake Skadar National Park. 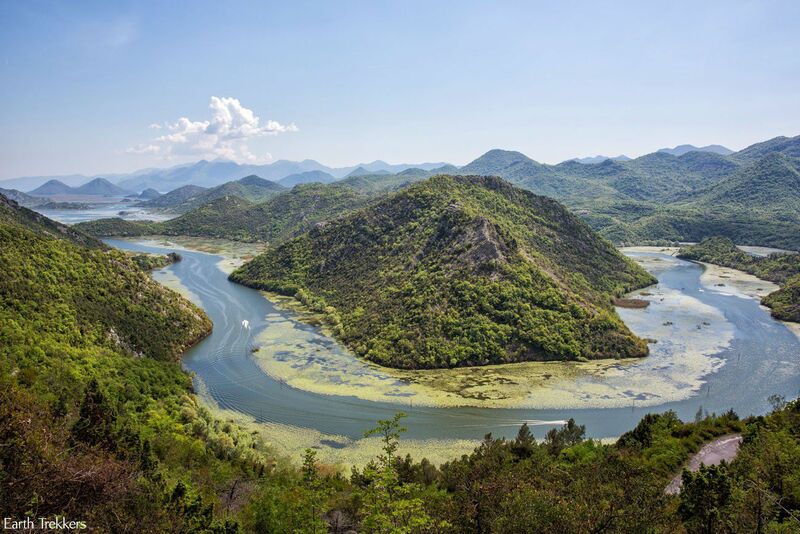 Just 30 minutes away, Skadar makes a nice detour if you want to go off-the-beaten-path and see the wetlands of Montenegro. Sveti Stefan is one of the coolest looking walled towns in Montenegro and we just had to see it. It was built as a fort in 1442 and now it is a luxury resort owned by Aman Resorts. 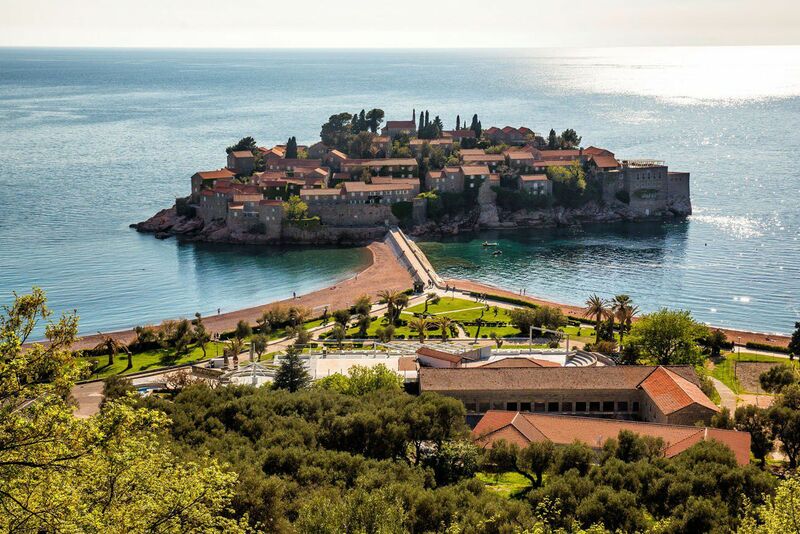 Access to the Sveti Stefan is limited to those with reservations at the resort. Even though we could not go onto Sveti Stefan, we still enjoyed seeing it. Within walking distance is beautiful Milocer Beach, the perfect place to spend an afternoon on a hot summer’s day. 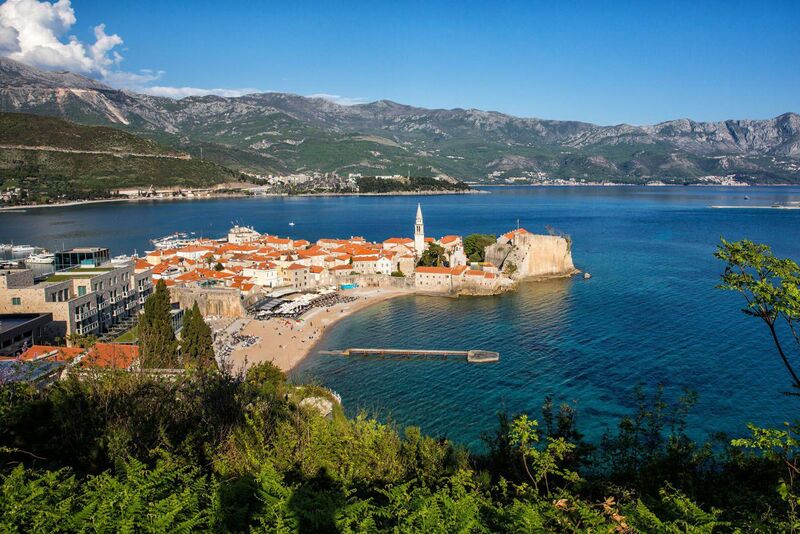 Just 15 minutes north of Sveti Stefan and Milocer Beach is the party town of Budva. Located on the coast, you could spend the afternoon on the beach here and then hang out at one of many nightclubs in the evening. 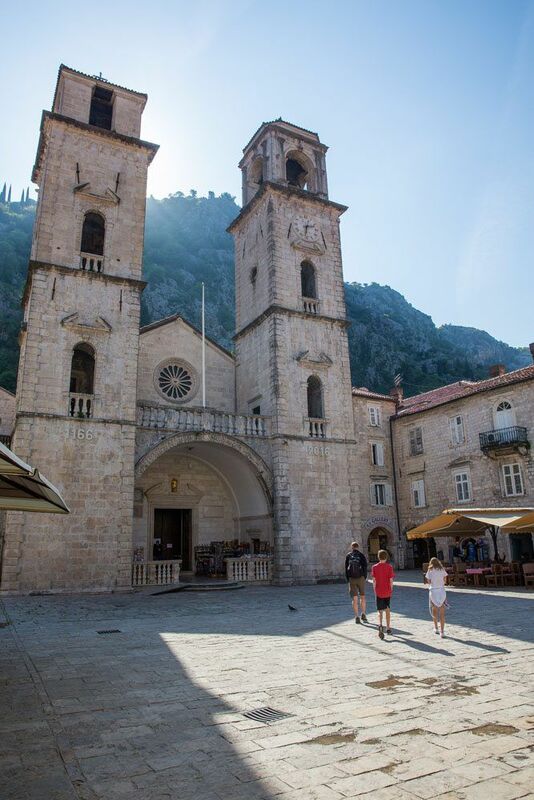 From Budva, it is just a 30-minute drive back to Kotor. Located in northwestern Montenegro, Durmitor National Park is a UNESCO World Heritage Site. This is the place to go for white water rafting, hiking, camping, and numerous other outdoor activities. The Ostrog Monastery is a Serbian Orthodox Church built into the side of a rocky cliff. 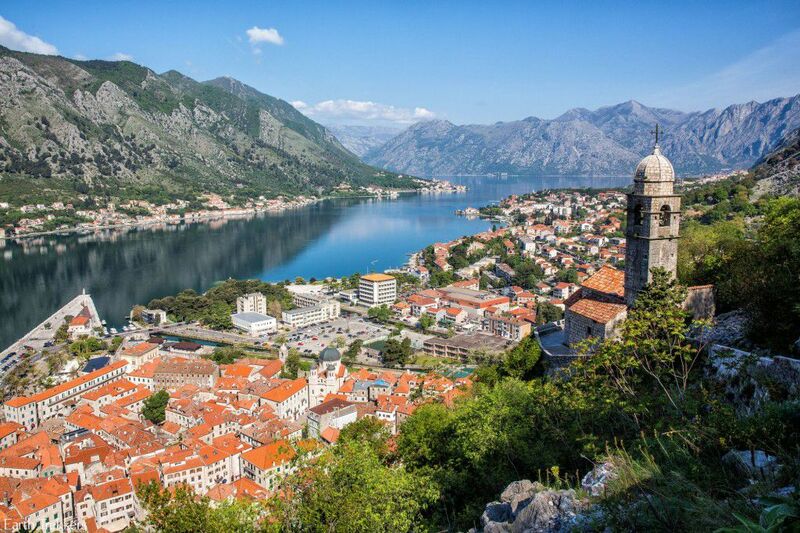 To get there, it is a 2-hour drive from Kotor. There are more coastal towns to visit, such as Tivat, Bar, and Ulcinj. 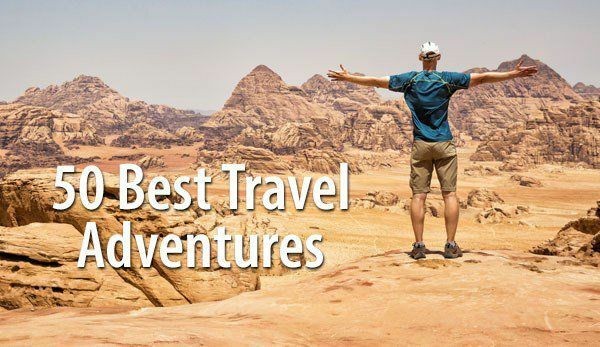 You could modify this itinerary by visiting Lovcen National Park and the Ostrog Monastery on day 2 and then spend a 3rd day (or more) exploring the towns on Montenegro’s Adriatic coast. We stayed in Kotor at Residence Portofino. We had the penthouse suite, a three bedroom, three bathroom apartment with kitchen and living room. From our balcony we had awesome views of the Bay of Kotor. 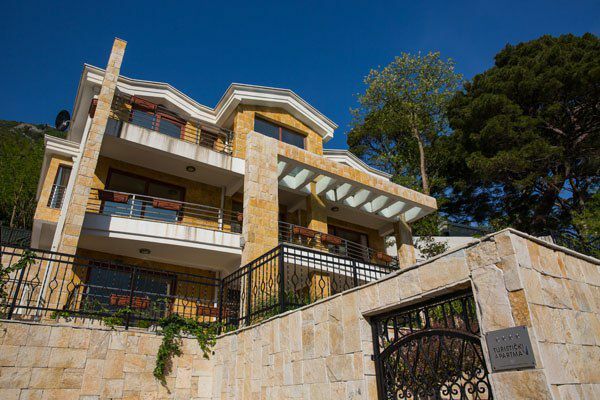 This place is a great value for the money…clean, quiet, spacious, and modern. To get here, it was a 7-minute drive from the Old Town on a very narrow road along the Bay of Kotor. It was a bit nerve-wracking passing cars on this road, with a drop off right into the water. 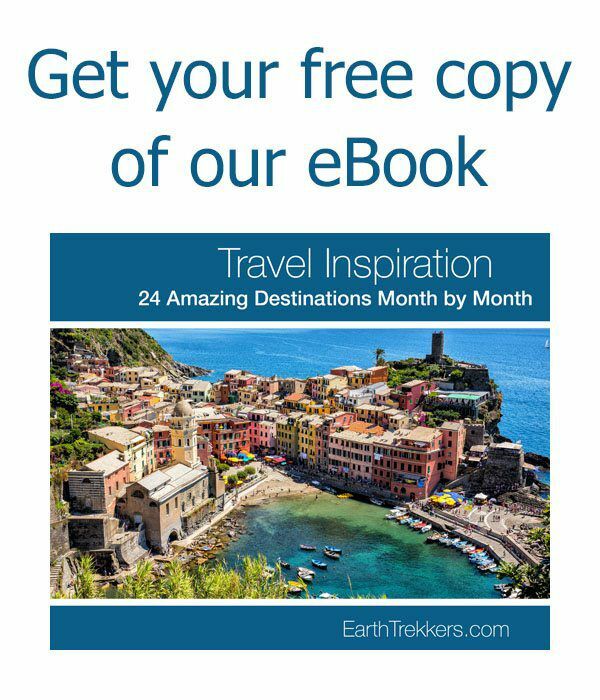 Planning a trip to Montenegro? 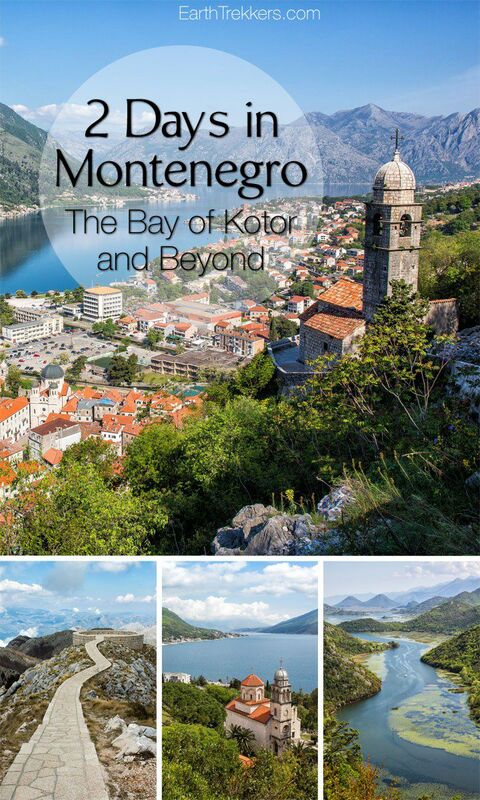 Read all of our articles about Montenegro on our Montenegro destination page.